Have I told you lately that I’ll have an upcycled design room at The Philadelphia Home Show? Well surprise, surprise, here I am telling you again. There are tons of great things at the show this year. Dana and I will have our own craft room, so you can come and create with us right there at the show! I’ll also be hosting 3 presentations , “Upcycling – formerly know as trash picking”. I’ll be giving you tips and tricks to help you create your own vintage look in your home. Plus, I’ll have some really cool giveaways thanks to Ki Nassuer and Flea market Style Magazine. Which area rug should I use in my room at the show? The black and white buffalo check will be on the walls, along with a little surprise wainscoting that you will die over! But, I’m not telling any more. Leave your choice of rug in the comments. The first person to comment with the name of the rug company that these rugs are from wins a six pack of tickets to the show (Feb 2-10 in Philadelphia, PA), so if you can’t make the show, hold your tongue. Okay, I’ll be back with more updates on the show room soon! I think I know the company, but unfortunately can't attend. thanks Pat. Wish you could attend! And I like Rug A best. ding ding ding!! !we have a winner! Would you like me to leave them at will call, Sue? Thanks so much!! I'm so excited! Let's plan for you to leave them at will call. I think I like "E" too Rebecca. I vote "B". Love green and black together!! Have fun!! me too. and I'm a sucker for anything green. thanks for chiming in Annette. I know, right? Green and black just gets me. Wish you could come to the show. Let me know if your plans change and I'll leave tickets at will call for you smarty pants. looks like "E" and "B" are the two favorite. Thanks for chiming in Karen. I agree. Ordered the green one this morning! E…..how pretty…these have got to be Dash and Albert rugs…..
e…..e……e……can you hear me…..i love it and wow would it ever make a statement…. 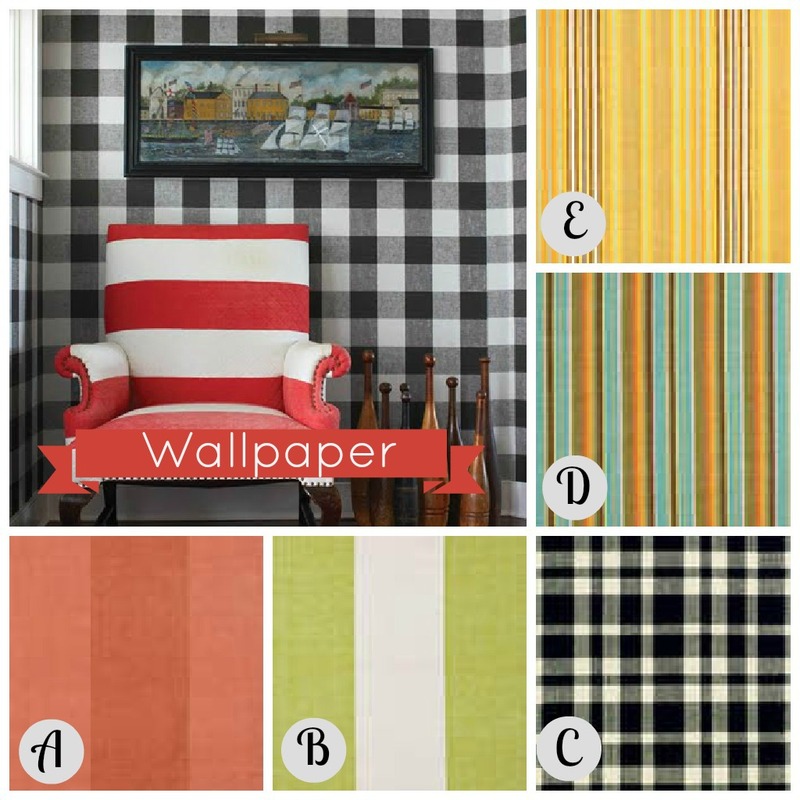 I am crasy about B, those green stripes will look fabulous with that check wallpaper. I would go with E & then pull all those colors into the room. I vote for B. I love the contrast with the walls. Best of luck. I vote for B – LOVE the green!